MLM Lifts and Mfg. enjoys a reputation for quick turnarounds on urgent specialty jobs. Making steel fabricated repair parts for the logging industry is not a job taken lightly. 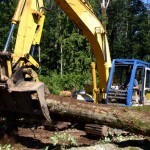 As various original manufacturers either discontinue parts for their equipment or raise the prices through the roof more and more logging and forestry professionals have turned to MLM for support. Often times all MLM needs is a sample of the part to be produced and once received the engineering data is immediately captured and production of a new part can begin. The product is also assigned a part number and cross referenced for the future. This means the next time someone needs that particular part all they need to do is call and place an order, no sample required. Help MLM build up a product line of American-Made replacements parts for the logging and forestry industry professionals. Put the engineering staff and certified welders at MLM to work—you will appreciate the cost-savings and the can-do attitude.